"Early history - 7000 BCE - 7th century - Records of the area where the emirate of Dubai is situated are very rare for any period before the 18th century." https://en.wikipedia.org/wiki/History_of_Dubai - lack of any information here is a major red flag to start off. Five thousand years ago developments in the Hajar Mountains east of Dubai changed the world. After millennia of supporting only a meagre hunter-gatherer existence, the area near the present-day border with Oman was found to be a rare source of copper. Pretty soon men learned to mine it, extract the metal, and mix it with tin to produce bronze. efficient and civilization possible in these places. Yet more similarities to the building work of the "gods" plus what are the chances of "meagre hunter-gatherers" rapidly becoming copper/metal/bronze producers who were creating cities in the area, without some kind of intervention? "Dubai tries so hard to promote this image of an ultra-modern city that they almost seem to suppress its past." It is interesting to see how much the history of that area is played down, it looks very likely that they are hiding what you have uncovered and have been doing so for a very long time. Slavery as we know it was exported to various parts of the old world from the area settled by the Annuna. Just look at modern Gulf views on exploitation of humans by humans and it is easy to understand how ingrained that mentality is.. In the Reciprocal System, chemical combination is a process of neutralizing speed by orienting atoms geometrically, much like assembling the pieces of a puzzle together -- just need to arrange the pieces so the proper tabs and holes line up. The consequence is that structure in one aspect alters location in the other. We normally see just one side of the system, the material one, where structure in time (atomic properties) alters locations in space (physics and chemistry.) The aetheric side follows the same rules, with the aspects of space and time reversed, but is interpreted more metaphysically -- structure in space (sacred geometry) alters locations in time (electric, magnetic and bioenergetic fields.) Just by understanding this "inverse chemistry," one can easily comprehend concepts such as Ley lines and Feng Shui -- how spatial orientation effects energetic fields. I saw a Dream catcher at work the other day and noticed the spatial pattern. It isn't precisely sacred geometry, but I'm guessing they have been passed down throughout history for actually being effective in altering bioenergetic fields. Keeping bad spirits away by... bringing order to a room? What about runes? Do they work in the same manner? I have a fair understanding of Elder Futhark. Since these are all spatial structures affecting the cosmic sector, it seems they do "magickally" affect circumstances and probabilities without any kind of power source or magickal charge, like Reiki for instance. Andrew wrote: What is Reiki-charge anyway? I'm not a Reiki person, so I do not know anything of that field. I am not Reiki person either, but I guess it is related to use of bioenergy, mainly chi. In asian cultures some healers use their own chi to heal others in need. Nei kung is one of that deals with such among others. Reiki is the balancing of the energy in an area in a way like a chiropractor but with out physically touching. Fantastic Beings, Where do I find them? So are there a mixture of material and cosmic beings we refer to as L-Ms? Fairies, for instance, only show up as force fields and golden tornadoes unless you have temporal vision. The dwarves went underground through the island of Gorias. Did the elves go underground too? The story of Santa Claus originating from elves that lived around the North Pole that would bring gifts and elven bread to others makes so much sense now. I saw a Giant's skull in a natural science museum in London. DW has spoke of unicorns being underground as well. I buy there is material evidence of giants in Australia. Did we kill them all or are they quarantined, the only thing government is proficient in doing. Dwarves, elves, unicorns have to have had material bodies or else where would the folklore come from? Bigfoot, yeti, the abominable snowmen, all went underground. No wonder this planet seems so dull. Where have the dragons gone? Andrew wrote: So are there a mixture of material and cosmic beings we refer to as L-Ms? Fairies, for instance, only show up as force fields and golden tornadoes unless you have temporal vision. Because of their harmony between body and soul, they can actually shift between the realms and become visible (though our technology has made that dangerous to do these days, occasionally causing spontaneous LM combustion). Curiously enough, the technique the LMs use to become invisible is exactly the same process that they tried with the Philadelphia Experiment on the Eldridge--boats don't have souls--but the crew did. When they shifted into the Other Realm, the Eldridge became nonlocal (explaining why it appeared at a location it was in the past), but the crew became their soul, localized in 3D time. The coordinate relation between ship and crew got lost, so when it was shut off, things were quite a mess, with sailors stuck IN the deck and bulkheads, as those parts of the ship materialized through them. Andrew wrote: The dwarves went underground through the island of Gorias. Did the elves go underground too? A number of the LM races left the planet, including the elves, back in 2010. Andrew wrote: The story of Santa Claus originating from elves that lived around the North Pole that would bring gifts and elven bread to others makes so much sense now. That connection was lost, because they always translate "elf" as "pygmie" in the old maps. In those days, the Bargos Islands remained protected from winter weather, due to the inner Earth access at Rupes Nigra, so trade was common between there and Northern Europe. It is also why the bulk of what we know about the LMs comes from that region of the world. Side note: here in the American west, the LMs did not get along with the natives and the general policy was "hands off" -- just keep clear of each other. They are referred to as Pukwudgie (Ute), Nimerigar (Shoshoni) or Anasazi (Navajo, Apache). Apparently the dispute stemmed from the fact that the LMs would not obey the Annunaki gods--and the humans here were intensely loyal to them (still are). Andrew wrote: I saw a Giant's skull in a natural science museum in London. Was it from the barred spiral galaxy on the Cepheus-Draco border? Andrew wrote: I buy there is material evidence of giants in Australia. Did we kill them all or are they quarantined, the only thing government is proficient in doing. Australia has a lot of independent research on giants, including megaliths, but like Chinese pyramids, a lot of effort goes into burying such discoveries. Given all the weirdness surrounding Antarctica these days, perhaps Útgarðar is still there? Andrew wrote: Dwarves, elves, unicorns have to have had material bodies or else where would the folklore come from? Yes, they have material bodies, just like you have a soul "body." But we can only observe and measure "changes in spatial location." When a body is in equivalent space, it is rotational--the start and end point of the change is at the SAME location, so we just cannot see it. Andrew wrote: Bigfoot, yeti, the abominable snowmen, all went underground. Yes, the Neanderthals went so far underground that they came out the other side, so to speak. Andrew wrote: Where have the dragons gone? They were kicked off the planet by the LMs after they lost the war. daniel wrote: (though our technology has made that dangerous to do these days, occasionally causing spontaneous LM combustion). So when one would try and go invisible or visible in an electromagnetic field as in the middle of a busy city, then "Whoosh!" and pile of ash is left? Kinda like that "Ancient device" in SGA that destroyed Wraith ships while trying to go to FTL. daniel wrote: That connection was lost, because they always translate "elf" as "pygmie" in the old maps. In those days, the Bargos Islands remained protected from winter weather, due to the inner Earth access at Rupes Nigra, so trade was common between there and Northern Europe. It is also why the bulk of what we know about the LMs comes from that region of the world. I just looked at the old map with Rupus Nigra, funny I recently discovered about John Dee and there is his name again related to this. The Rupes Nigra is mentioned in a letter to him from Mercator. I translated the Pygmie latin text on the map to 'pgmei here are 4 feet long to smoke' what the smoke' part of it mean? 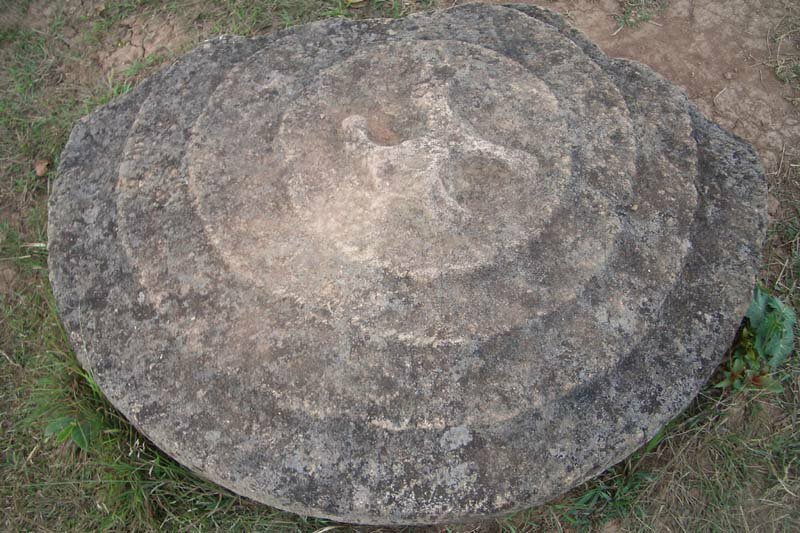 I'm going to look into the Australian megaliths, it got me thinking also of the 'Plain of Jars' in Phonsavan, Laos. Unfortunately I never got to go when I was there but they are fascinating. Made up of mysterious caves and hundreds of hollowed-out stones around one to three meters high and weighing up to 13 tons each, scattered over more than 90 sites across the Xiengkhouang plateau. Dated to have originated sometime between 500 BC – 800 AD, some jars stand alone, while others are part of small clusters. The area is steeped in local myth, and has been called the most mysterious place in Laos. Local folklore says that the area used to be inhabited by a race of giants, and that their king Khun Cheung threw a party after a victorious battle in a long and brutal war. According to this legend, the jars were used to create and store Lao Lao, (a potent rice wine traditional in Laos) for consumption at a massive victory celebration. The bigger jars were used by important giants, and the biggest jar reserved for the king himself. Apparently these ancient giants didn’t clean up after the party, as the jars remain scattered all over the area. I would imagine these to be a lot older then this. Mainstream reason for them range from 'distilling vessels' to burial sites. The giants party gets my vote though There is only one that has any markings on, called a 'frogman', which has parallels with a rock painting at Huashan in Guanxi, China.